The news about the Samsung Galaxy Note8 is already out in the open and the company is moving on to its next big things. In the case of IFA 2017 those are TVs and smart wearables such as Gear Sport, Fit2 Pro, and IconX (2018). Samsung Gear Sport is the latest smartwatch entry designed exclusively for sport and with focus on swimming. It's a unisex device, which means it comes in one size - 42mm, 1.2" Super AMOLED 360p screen - and one size band at 20mm width, though the latter will vary in length. The Gear Sport weighs 50g without a strap, runs on a dual-core 1.0GHz processor and has 768MB RAM. There are 4GB of onboard storage, heart-rate sensor, GPS, Wi-Fi, and Bluetooth. The integrated battery is 300 mAh and is wirelessly charged. The Gear Sport particularity targets swimmers and its proofing specs say it all - 5ATM resistance (50m depth of pressure), MIL-STD-810G rating which translates into pool and salt water, sand and dust, UV, shock, among others. The front glass is Gorilla Glass 3, while the case is made of stainless steel. 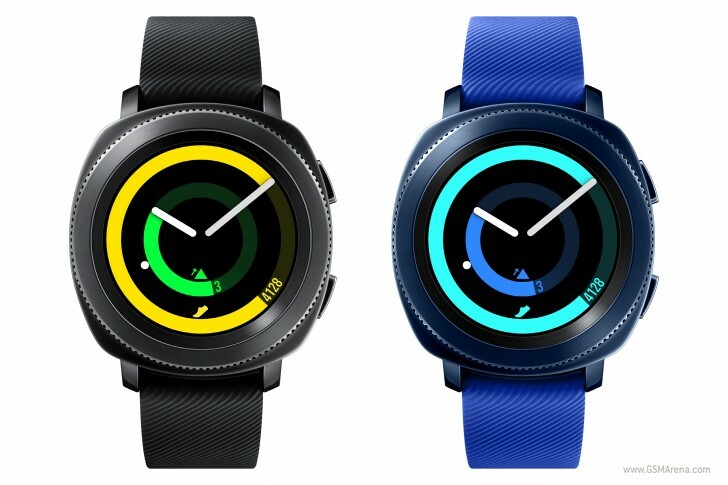 The watch operates on a Tizen OS, supports control of IoT-enabled devices via Samsung Cloud, Samsung Bixby, Samsung Pay, and remote-control functions for Power Pont and Samsung Gear VR. The S Health app to support Gear Sport will be available for any Galaxy running Android 4.3 or later, any Android smartphone running on 4.4 KitKat or later, or any iPhone 5 or later running on iOS 9 or later. 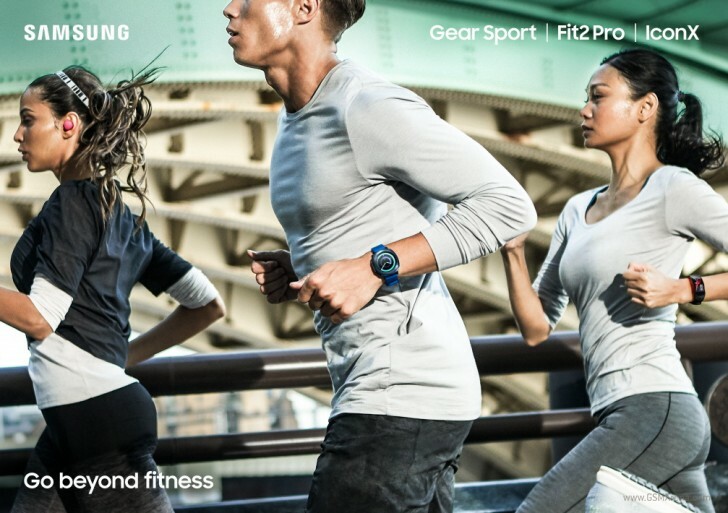 Samsung Gear Fit2 Pro official page was published hours before the Note8 unpacking, most probably by accident. It's basically the same as the original Fit2, but enhanced with 5ATM water resistance, MIL-STD-810G certification for sea water, shock, UV, and more, and support for the new swimming exercises. In case you are unfamiliar with the previous model, here is a quick reminder of the specs - a 1.5" curved Super AMOLED of 216 x 432 px and Gorilla Glass 3, 34g of weight, a dual-core 1.0GHz processor, 512MB RAM, 4GB storage, heart-rate sensor, GPS, Wi-Fi, Bluetooth, and 200 mAh battery. Just like the original mode, this one will be available in Small and Large sizes, sold separately. Samsung has partnered with various companies for enhanced user experience. Spotify allows you to save up to 500 songs for offline listening, you also get 1-year premium subscription for UA Record for free. Partners such as Speedo and Under Armour will offer their expertise for the swimming workouts. 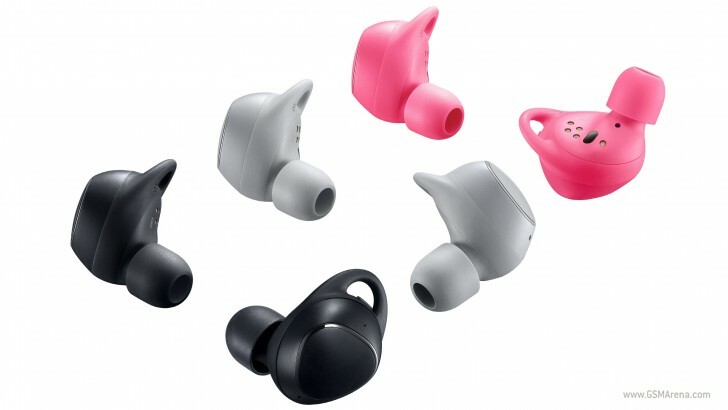 The last accessory announced by Samsung was the Gear IconX (2018) cord-free earbuds. Those are the second generation IconX and come with improved battery life - they can offer 5h of Bluetooth streaming music (7h when in standalone mode) or 4h of talk time. Each earbud has its own 4GB of storage, 82mAh battery, and weighs 8g. Each of those also comes with a capacitive surface with gesture support - single/double/tripe tap, single/double tap and hold, and swipe up/down. The IconX (2018) also support Bixby, of course. The charging case is smaller than before, supports quick charging and you can get a full charge of it (total capacity of 340 mAh). Samsung says 10mins of charging through the case will give you battery enough to last you 1h of exercises. If you want to know more about these wearables, you can check our hands-on right here. Nice additions. It's good that these smartwatches have the same enhanced resistance as most analog watches. Does this have Bluetooth 5.0 though? Can you finally get some serious distance from your phone now?